Today's complex youth sport system necessitates significant resources to develop an athlete and play competitive sports (Sport Participation Rates Among Underserved American Youth, University of Florida's Sport Policy & Research Collaborative, 2014). Travel-team parents spend an average of $2,266 annually on their child's sports participation, and at the elite levels some families spend more than $20,000 per year. The barriers to participation emerge early, with the rise of grade-school travel teams and elite sport training options not accessible to many lower-income kids. In 2015, about one in three parents (32%) from households making less than $50,000 a year told researchers that sports cost too much and make it difficult for their child to continue participating. That is compared to the one in six parents (16%) from households making $50,000 a year or more who said the same. The annual survey by the Sports & Fitness Industry Association (SFIA) in 2017 found only 34% of kids ages 6 to 12 from homes with $25,000 or less in income played team sports, compared to 69% of kids from $100,000+ homes (State of Play: 2018 report). As adults, the disparity between participation based on income levels continues. Only 15% of lower-income adults (household incomes less than $25,000 a year) play sports, while 37% of higher-income adults (household incomes of $75,000 a year or more) do play (Robert Wood Johnson Foundation/Harvard/NPR, 2015). There's a relative lack of access for minority children. Sport participation rates for white children exceed that of African-Americans, Hispanics, and Asian kids. Data on other historically marginalized groups such as Native-American children are not even reported in government-funded studies that track physical activity in youth (University of Florida's SPARC, 2014). In the Native American community of San Felipe Pueblo, N.M, the only organized sport option is an after-school soccer program serving 250 of the 1,500 kids who live there and which is organized by a non-profit that addresses childhood obesity in tribal areas (Notah Begay III Foundation). Latinos/Hispanics are being left behind. In Harlem, where 47% of the youth are below the federal poverty level, the top three sports that Latino children say they want to try (skateboarding, fencing and ice hockey) are not widely available to them (State of Play: Harlem, 2018). Play space is one of the largest barriers for local leagues in Harlem, as many fields are occupied by programs that aren’t serving local residents. There are also transportation barriers that limits who can reach the Randall’s Island sports complex’s 60 new athletic facilities. Research also shows that Latinos are being left behind in the U.S. pay-to-play soccer model. Youth with disabilities still struggle for access, despite growth in sport options driven in part due to anti-discrimination laws. About one-third of Alabama families who have a child with a disability reported it’s “very hard” to obtain recreational opportunities, according to the Alabama Department of Public Health (State of Play: Mobile County, 2018). Often, the biggest barrier is simply a lack of awareness about how to engage children with special needs. Children who have disabilities are 4.5 times less active and have obesity rates that are 38% higher than other youth (Physical Literacy in the United States: A Model, Strategic Plan, and Call to Action, 2015). Access is also shaped by geography and gender. In "low socio-economic schools," those that serve the highest percentage of kids on free or reduced-price lunches, only 24.6% of eighth graders play sports. For "high socio-economic schools," it's 36.1%. Despite major gains among girls over the past four decades delivered by Title IX legislation and enforcement, in 2012, the participation rates for girls remained 2-5% lower than for boys (Bridging the Gap, RWJF, 2012). A 2015 study suggests that gap may be closer to 6% (RWJF/Harvard/NPR, 2015). As adults, the gender gap is more pronounced: 35% of men say they play sports, while only 16% of women say the same thing (RWJF/Harvard/NPR, 2015). In Washington, D.C., the percentage of athletic opportunities provided to public high school students has been as low as 15% for boys and 6% for girls (Women's Sports Foundation, 2011). Disparities exist by state, too. Northeast and Midwest states generally offer more participation opportunities than those in the South and West. Georgia has the lowest rate for girls (22%), Florida the lowest for boys (30%) (Women's Sports Foundation, 2012). Fading is the era of sandlot or pickup ball, a form of play that organically promoted innovation and fitness among generations of Americans. More than 40% of parents whose child plays an organized sport say their child does so year-round (RWJF/Harvard/NPR, 2015). Yet free play has been shown to produce higher levels of physical activity than organized sports. One study found that 43% of youth sports practice was spent being inactive (Physical Activity During Youth Sport Practices, 2011). Free play is all but a thing of the past in Western New York (Buffalo, Greater Rochester and the Finger Lakes) and Southeast Michigan (Detroit and surrounding areas). According to a household survey of 22 counties in those regions, fewer than one in five youth play football near their home (Aspen Institute/Ralph C. Wilson, Jr. Foundation survey, 2017). It's one in 10 for basketball and less than one in 20 for baseball and soccer. Today, in those regions, the only activity that most kids engage in near their home is bicycling, enjoyed by about two-thirds of kids. Other responsibilities are keeping kids from free play. In separate 2018 Aspen Institute surveys, school work was listed as the No. 1 reason why children don’t play sports in Harlem (25% boys, 30% girls) and in Mobile County, Alabama (28% boys, 29% girls). About one in five children in each community also said they don’t play because they don’t have time due to family responsibilities. Many children today have to work or take care of younger siblings. There's a lack of mainstream options for the moderately interested athlete. About 23% of middle schools and 40% of high schools do not offer intramural sports (Bridging the Gap, RWJF, 2012). In communities with fewer resources, sport options can be organized especially around the more motivated athletes and families. Parents from lower-income households are nearly twice as likely to say they hope their child will become a professional athlete as those from the higher-income homes (39% vs. 20%), according to the RWJF/Harvard/NPR survey. Half of all vigorous exercise engaged in by Americans occurs in parks. People who live closer to parks report better mental health. Time spent in green outdoor spaces has been shown to boost focus and concentration, and kids with attention deficit hyperactivity disorder (ADHD) experience milder symptoms when they play outside in a natural setting. But in some cities as many as two-thirds of children are without access to a nearby park (The Trust for Public Land). The deficits are greatest in predominantly African American and Hispanic neighborhoods. Community Development Block Grants provide up to $100 million annually in support. Still, federal matching funds for urban parks have been slashed over the past decade, as has support from the Land and Water Conservation Fund (LWCF), which helped get more than 40,000 outdoor recreation projects built, most between the 1960s and 1980. Some good news: The LWCF disbursed $45 million in 2015 and committed $110 million in 2016, the most in more than a decade. However, the LWCF expired in 2018. Finding safe play spaces can be a challenge for some communities. For instance, only 64% of students in a two-square-mile area of East Baltimore said there’s a safe place to play in their neighborhood, according to a 2017 survey by the Aspen Institute. In a three-square-mile area of East Harlem, youth there told the Aspen Institute that the prevalence of drugs, alcohol and police activity on the playgrounds prevents them from having safe play spaces nearby. Just walking to safer play spaces can be a barrier. Nearly nine out of 10 parents have concerns about risk of injury (87.9%), according to an espnW/Aspen Institute Project Play Survey of Parents on youth sports issues in 2014. Parents were more concerned about injuries than any other issue, including the quality or behavior of coaches (81.5%), cost (70.3%), the time commitment required (67.9%), and the emphasis on winning over having fun (66.1%). Read full results from the nationally representative survey. In a 2018 survey by the Hospital for Special Surgery and Aspen Institute, concussions ranked as the No. 1 injury concern for all parents. Parents with middle-class income, white parents, and parents with a post-college education were more likely to rank concussion as a top concern. Among all parents, the next biggest injury concerns were joint injuries, broken bones/sprains/strains, and overuse injuries. Children have concerns about injuries, too. Fear of getting hurt was the No. 2 reason why children in Baltimore and Harlem said they don’t play sports; it was No. 3 for youth in Mobile County, Alabama, according to Aspen Institute surveys in 2017 and 2018. Read the Baltimore, Harlem and Mobile County reports. More than 3.5 million children under age 14 receive medical treatment for sports injuries annually. According to the CDC, more than half of all sports injuries are preventable. Overuse injuries are responsible for nearly half of all sports injuries to middle and high school students (STOP Sports Injuries). Specializing in sports early carry risks of higher injury rates, increased psychological stress, and quitting sports at a young age. For most sports, there is no evidence that intense training and specialization before puberty are necessary to achieve elite status, and specialization should be delayed until late adolescence. (Sports Specialization in Young Athletes: Evidence-Based Recommendations, 2013). A 2018 survey by the Aspen Institute and University of Texas showed that high school athletes on average began specializing in their primary sport as young as 10 (soccer, baseball, basketball and softball). Girls waited about two more years to start specializing in basketball than boys. High school athletes who played their primary sport 10 to 12 months per year scored significantly better on social, emotional and psychological elements than athletes who focused on their primary sport less, yet the year-round athletes reported worse negative experiences. Most youth coaches do not receive any training in key competencies in working with children. 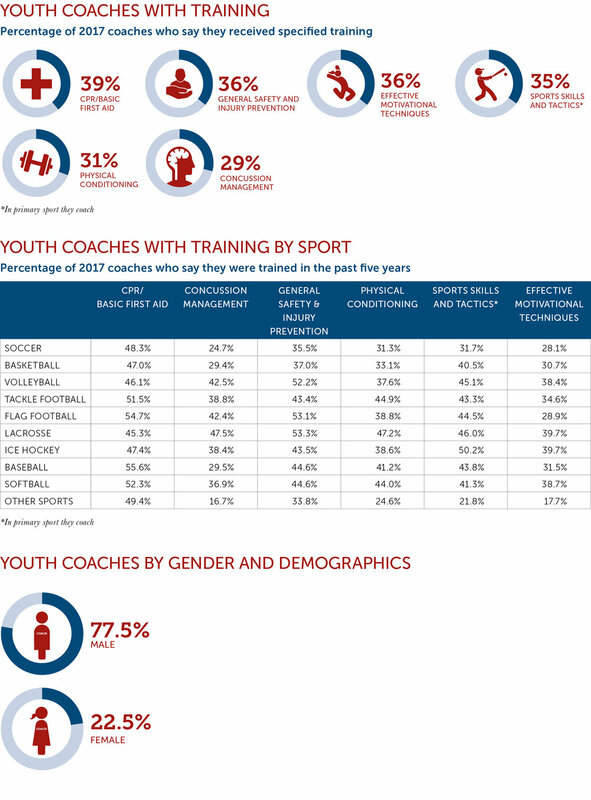 Less than four in 10 youth coaches say they are trained in any of the following areas: sport skills and tactics, effective motivational technique, or safety needs (CPR/basic first aid and concussion management), according to 2017 data produced for Project Play by the Sports & Fitness Industry Association (SFIA). There has been little to no improvement in recent years. since then, according to 2016 data. Lacrosse had the highest percentage of trained coaches in four of the six categories, based on the nine sports evaluated by SFIA. Soccer was last in five of the six categories. Community leaders in Western New York consistently characterized coaches there as overly concerned with winning and that such priorities were a negative influence on sports participation, according to the Aspen Institute's 2017 report on the state of play in Western New York. The value of trained coaches was established long ago by researchers, with one study (Smoll and Smith, 1992) finding that when coaches received training in skills and communicating effectively with kids, only 5% of children chose not to play the sport again. With untrained coaches, the attrition rate was 26%. Women remain an untapped area to develop more coaches. Only 23% of adults who said in 2017 they had coached kids 14 and under in the past five years were female (SFIA/The Aspen Institute, 2018). That’s down from 28% in 2016 and the lowest on record dating to 2012. The lack of female coaches is occurring despite growth in female sports participation — 52.3% of girls ages 6 to 12 played a team sport at least one day in 2017, up from 48.7% in 2013. Children today often spend many hours in front of screens (mobile phones, computers, video games, TV), with products that have gotten better at getting and keeping their attention. Even for those who are playing sports, these sedentary hobbies are competing interests in getting kids active through sports, according to parents. More than one in three parents say it is a challenge to make sure their children get enough exercise (RWJF/Harvard School of Public Health, 2016). A Gallup poll found children ages 2 to 10 spend significantly less time engaged in free play than they do in front of screens (18 to 21 hours a week). Nearly all of the kids had more screen time than the number of hours per day recommended by the American Academy of Pediatrics. Now, say hello to esports. It's young people watching other young people play video games – the latest success of the industry in giving kids what they want, and thus another potential competitor for kids’ attention. College scholarships now exist for esports. The National Association of Collegiate eSports has climbed to more than 30 member colleges, whose average scholarship payout is about $7,600 (Inside Higher Education, 2017). In 2018, the National Federation of State High School Associations began sponsoring esports, and five member state associations now stage esports state championships. There are now efforts by gaming leagues to identify video game players before middle school in order to compete with other countries (The Associated Press, 2018).